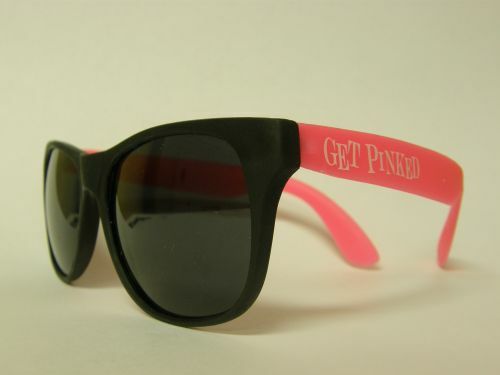 Buy a Pair of "Get Pinked" Sunglasses! Your Purchase Will Help Prevent Breast Cancer in Dare County. Sun Realty is proud to participate for the second year in the Outer Banks Hospital's "Get Pinked" Campaign. According to recent North Carolina breast cancer statistics, 34 new cases will be diagnosed and 6 deaths will occur in Dare County in 2011. At Sun Realty, we want to do our part to support breast cancer prevention, treatment and detection. 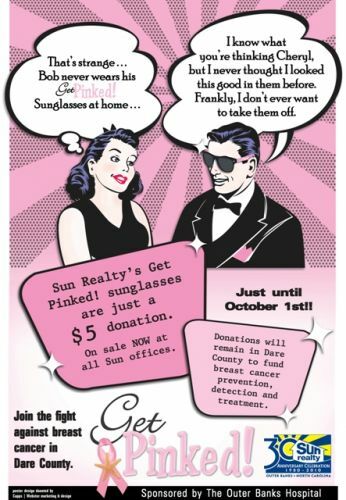 Stop by any Sun Realty Office, or contact us at 252-441-4321 to purchase your pair of "Get Pinked" sunglasses. Your $5 donation will help fight breast cancer right here in Dare County. Money raised will support mammography and ultrasound screening programs. Your "Get Pinked" donation could help save the life of a mom, daughter, sister or wife right here on the Outer Banks. See Who "Gets Pinked" Today! Be sure to check out Sun Realty's Facebook Page for the latest pics of employees, sales agents, guests, owners and friends wearing their "Get Pinked" sunglasses!